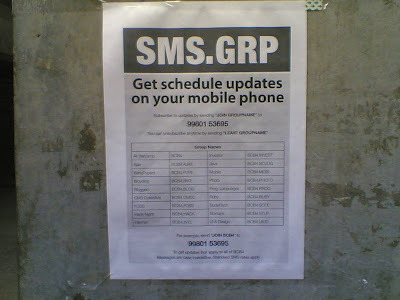 The Session Details were available in SMS. This was one of the initiatives from the organizers. As the sessions spanned multiple conference rooms, it was difficult for the attendees to check the rooms and its corresponding sessions. This initiative was helpful for all the attendees who had registered for the messages. If you do not believe, I received almost 80 messages on the first day of the barcamp.